But I laugh and baby girl squirms. Sorry Secret decay of ice fever. is no more Wet, ok Brilliant too. So lovely! 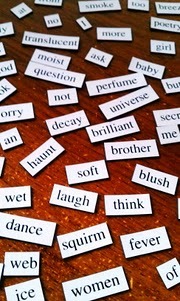 I love how poetry flows and moves from my desk of spread out tiles to the net and around the world and back again! Magical Sulekha! Tameka, thanks a lot for the idea and your lovely words. Very well written….A pleasure to be here as usual. From Sulekha prompted by Tameka damn you knew this was going to be great and it was even better then I though it would be!! Excellent ladies!!! I smoke poetry and squirm. Translucent universe. Brilliant fever. Question me not. It's my secret dance. Oooof too good!! What will we do with you Sulekha Rawat?? You got me on sensuousness!.. You gals rock! Such a pretty mind image! I really appreciate your comments and love you guys for visiting and liking my attempt in this creative challange. wah wah wah wah – and many more innumerable wahs. You are fascinating Mitr – Loved it.